Vibraphonist Rusty Burge will be visiting Bungalow Jazz for a house concert on October 26 at 5 p.m., accompanied by Kim Pensyl (trumpet), Phil DeGreg (piano), John Taylor (drums), and Doug Richeson (bass). Rusty Burge attended the Eastman School of Music in Rochester, New York for his undergraduate work and completed his masters at the Cincinnati College Conservatory of Music. At one time he was the principal percussionist for the West Virginia Symphony. 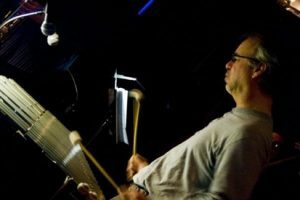 Burge has been a member of Percussion Group Cincinnati since 1992, having performed in many places across the world including the Japan World Drum Festival, the Chinese International Music Festival, and the Ravinia Festival in Chicago. He teaches percussion and jazz vibraphone at CCM, where he also directs the CCM Steel Band. Burge has also written a book on playing the vibraphone that is highly regarded and considered to be an essential tool for improvisational mallet players. Burge has recorded three albums of his own, often noted for the melodic feel of the percussion based albums, and has also recorded with numerous other musicians. Mr. Burge was kind enough to answer some questions for JazzColumbus.com, including plans for a new album and what we can expect to hear this Sunday. JC: Is the vibraphone the first instrument you learned to play? No I started on piano then moved to snare drum and drum set. I started playing the vibraphone when I got to college. JC: Do you play any other instruments? I play all the major percussion instruments. Mallets which include marimba, xylophone, bells and vibraphone. Also timpani, drums set and other world percussion instruments. JC: Your book on the vibraphone is considered the only of its kind; did you set out to create a new method for playing the vibraphone? There are several great books for vibraphone, but this one might be the first ebook which also includes video. I also, wanted the book to be useful for both classical and jazz musicians. It focuses on technique study that builds basic technique, but can also be useful in creating ideas for improvisation. JC: Do you have any plans to release a new album soon? I will be releasing a new recording later this fall with pianist Steve Allee. It features compositions by both of us. JC: Bungalow Jazz is a unique venue to play music in; do you enjoy playing in such an intimate setting? Playing in an intimate setting usually means the audience is listening and interested in the music. Musicians usually bring their best creativity when they know the audience is engaged in the music. It creates a nice bond between the listener and the player. JC: Where is the most interesting place you’ve ever played a show? I have played several concerts in an old church in Cincinnati. (built in 1827) It has original seats and is quite small, but makes a wonderful concert space. JC: What can the audience expect to hear on October 26? We will be playing some beautiful Brazilian tunes by Jobim and others as well as some selections from the American songbook.